Riding on the Road - Riding Side by Side - Cyclists may ride side by side, but not more than two abreast (RCW 46.61.770). Headphones & Riding Don't Mix - Seems like veryone grooves to their favorite tunes when they exercise but headphone use should not permitted while cycling. It is terribly unsafe and quite frankly, rude to your fellow riders. Another Don't - Cell Phones - If you must use your cell phone, please pull over at a safe place. If riding in a group, note that others are not obligated to wait while you’re talking or texting. If you do pull over, be prepared to either finish solo or (if you can) catch your group. Stay in your lane - Staying on the correct side of the centerline is not just a good idea, it's the law. There is never a reason to cross the centerline. This action is 100% reckless and is plain stupid. A quick “on your left” will usually clear the way for you to pass safely without crossing the centerline. Warn others of hazards - Communicate verbally or through hand signals any road debris, approaching vehicles or other hazards. It's the right thing to do. Don't Run Red Lights - Besides being unsafe, against the law, and damaging to our collective reputation, it’s also disrespectful to all the groups who are working hard to convince communities to improve cycling infrastructure and enhance cyclists’ safety. 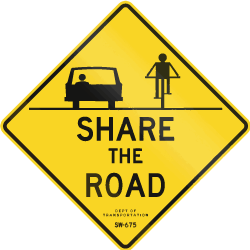 BE RESPECTFUL OF ALL USERS OF THE ROAD - it will pay off in spades.